*This blog is informational in nature on an approach to mass updating WebCenter Content. Because each WebCenter implementation is unique in nature, it is not intended as a “how to” guide and any use of this information is at your own discretion. If I had $100,000 for every time someone wanted to perform a mass update in WebCenter Content, I’d be a very wealthy man. The request doesn’t happen enough for me to lower the price, but it’s still a fairly regular request so I think it’s worth knowing how to answer the question: “How can I update all of these content items with a new metadata value?” Fortunately WebCenter Content offers a number of ways to do this. Before we dive into the details I’ll just state the obvious disclaimer. Performing mass updates to large groups of content can have some unintended consequences so be careful! Surprise!!! There’s an incredibly easy to use feature called “Global Update” and as the name suggests, it allows you to perform global updates to metadata. The only caveat is that you must have WebCenter Content: Records Management enabled to use this feature. From the Records menu select Global Updates. From there you will see three options that you can update globally: Retention Categories, Records Folders and <insert heavenly choir of angels singing here> Content! When you select the Content option you will see the Global Updates: Content screen. 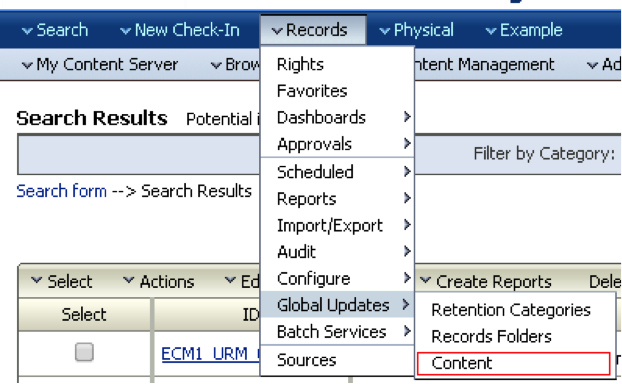 As shown above, you can define a query to select the content you want using standard metadata fields or free text searching and then define the metadata field to update. Notice the Preview option allows you to see the results of your query to insure you are updating only the content you want to update. 1) Login in as weblogic or Admin user. 4) In the User Admin Applet > select the top menu “Security” option and then select the “Permission by Role” option. 5) In The “Permisions by Role” section, Highlight the RMadmin Role and then select “Edit RMA Rights” option. 6) Select the “Admin” Tab from the “Edit RMA rights” section, then check the “No Security” option and select OK to save. 7) Exit out of the applet, and navigate to “Records “ and choose “Global Updates” to confirm this feature has been enabled. For content that is stored in folders there is an exceptionally easy way to perform a mass update of metadata values. However, it’s important to know that there are two versions of folders implemented in WebCenter Content and as a best practice you have either one or the other, not both. Let’s start with the “old” version of folders which is called Folders_g. If you click on the Browse Content menu and you see an option for Contribution Folders, then you have Folders_g. To perform a mass metadata update for all content items in a Folders_g folder you browse to the folder containing the content you want to update. At that point you click on the Information icon. On the next screen you select the Actions menu and choose Update to update the metadata for the folder. Once you’ve updated the metadata from the folder, you still have one more step. Select the Actions menu again and choose Propagate. This will propagate the metadata change to all content items in that folder. If you have the new version of folders, called Framework Folders, when you click on the Browse Content menu you will see an option that says Folders. As with Folders_G you navigate to the folder which contains the items you want to update. Once you’ve selected your folder choose the Edit menu and update the metadata values for the folder. After the metadata for the folder has been updated, select the Edit menu again and choose Propagate. This will update all of the content items in the folder with the new metadata value. Yes, I know what you’re thinking. Folder propagation is great but it leads to an obvious question: What if not everything in the folder needs to be updated or your content is spread across hundreds of folders? With the advent of Framework Folders, Oracle invented a new gizmo called a Query Folder. A Query Folder is a folder which contains the results of a query. To add a Query Folder you simply browse to any folder in your system that you want to contain the Query Folder, click the Add button and choose New Query Folder. 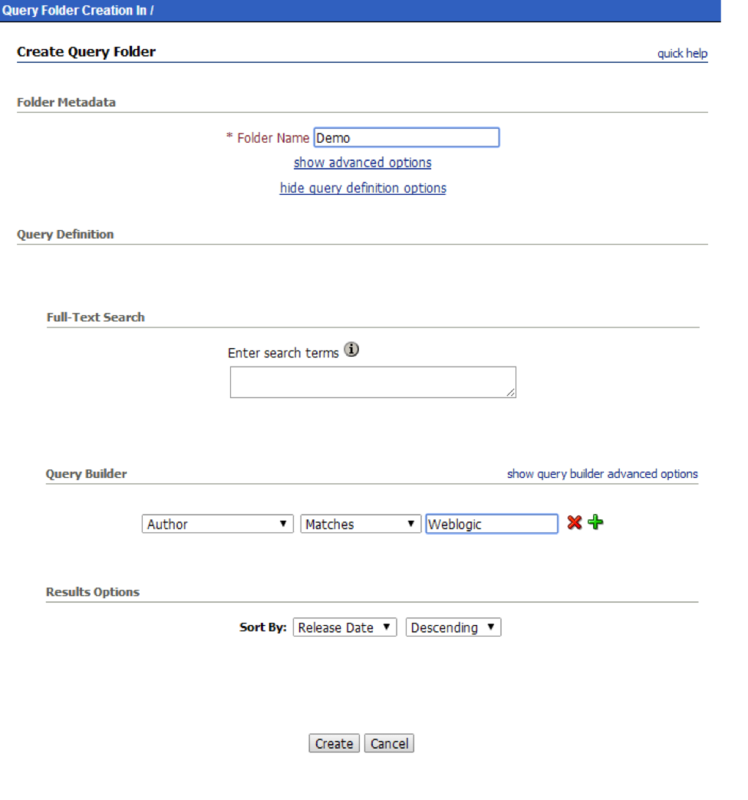 The Query Folder creation screen allows you to use Full-Text Search or Query Builder options to determine which content items should be included in the Query Folder. Once created, you will see a new Query Folder on your system and it will have a different icon that is a folder with a magnifying glass rather than just a folder. 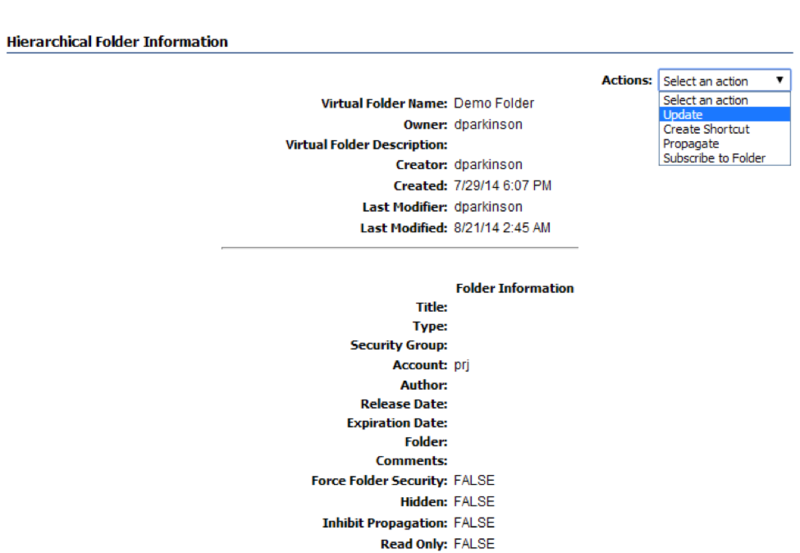 This new Query Folder contains call content items that match the query defined when the folder was created. 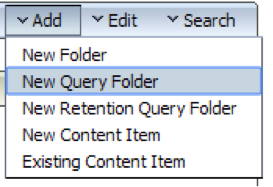 With the new folder in place you can use the Folder Propagation techniques above to update all of the content items in your Query Folder. This two step process of creating a Query Folder containing just the content items you want plus folder propagation, gives you the ability to have fine grained control over your mass update. As you might expect, there are a number of hard and complex ways to perform mass metadata updates as well, but with the tools above, making mass metadata updates can be quick and easy. If you have questions about WebCenter and want to talk to someone at TEAM, contact us today! This entry was posted on Thursday, October 2nd, 2014 at 12:47 pm and is filed under ecm, How To, Oracle, WebCenter Content. You can follow any responses to this entry through the RSS 2.0 feed. You can leave a response, or trackback from your own site. Adding the usage of archiver for achieving this requirement would complete all the OOTB possible ways . Great post Dwayne! Note that with Folders_g, the only field values that will propagate are those selected on the “Information Fields Inherit Configuration” screen. Navigate to “Administration > Folder Configuration > Information Fields Inherit Configuration”, select the fields you wish to have propagated from the folder to the included documents, and then click “Update”. Once that’s done, when you select the propagate option in your folders action menu, those checked fields will trickle down from the folder to the child items.